There was a man (name withheld) who grew to have a very cynical attitude toward religion. Whenever things went wrong in his life, he always blamed God. He continued to attend Mass but seldom went to confession or to Holy Communion. As time passed, his health began to fail and at the same time, the problems in his family life became almost overwhelming. One Sunday he walked into church and took his place in the very last pew. He decided on that day that he was finished with the Catholic Church forever. He prayed to God and said, “I don’t belong here. You hate me and you only help your favorite ones.” After that, he threw away all the holy pictures, religious medals and rosaries that were in his home. He would not allow any of his family members to mention the word “God.” This situation lasted for seven and a half years. The man made the acquaintance of a woman who had a great devotion to Padre Pio. On one occasion, when he spoke to her about some of his problems, she told him that she believed that Padre Pio would be able to help him. “I am going to write a letter to Padre Pio and ask him to pray for you,” she said. She encouraged the man to write a letter to Padre Pio as well and he agreed to do so even though he was convinced that it would do no good. More than anything else, he wanted to prove to the woman that Padre Pio would not help him. He was certain that Padre Pio only helped his favorites. In the letter, he asked Padre Pio to pray for an improvement in his financial situation and for an increase in faith for his family members who had fallen away from the Church just like he had. An answer came back in the mail which said that Padre Pio sent his blessing and was praying for him. The man threw the letter away. The days passed one after another but nothing improved in the man’s life. He felt that his burdens were too big and too many to carry any longer. It appeared that he was headed for a complete nervous breakdown. The letter to Padre Pio was mailed out at the end of March 1968. In April, the man noticed something like the rich and pleasant scent of tobacco pervading the air. At that moment, he thought of Padre Pio and started to cry. But they were tears of joy, not sadness. The next Sunday he felt a desire to go to Mass. He called his family and told them what had happened. They thought he was finally having a breakdown. He attended Mass and shortly after, he made a sincere confession. Wanting to learn more about Padre Pio, the man bought several biographies about his life and read them cover to cover. The information he learned from the books made such an impact on him that he returned to the practice of his Catholic faith. Padre Pio died five months later. As time passed, the man became aware of the blessings his family and extended family were receiving through the intercession of Padre Pio. One of his brothers who had struggled with alcohol addiction was finally able to stop drinking. In addition, two members of his family returned to the practice of their faith. “I am now at peace with God who was so good to me after I hurt Him so much” the man said. There was a woman (name withheld) who was born and raised in Hong Kong. She always felt like an outsider, like the “black sheep” in the family. She never felt like she was accepted by the other members of her family. Her seven brothers and sisters had all been baptized into the Catholic Church. She was the only one of the siblings who had never been baptized. She attended a Catholic school because her father insisted that she do so but she was unhappy at the school. She was very much opposed to the teachings of the Catholic Church. She did not believe in the theology of the cross. When she was fourteen years old, she decided to join the Jehovah Witnesses. Years later, she moved to the United States and eventually got married. She still attended the Jehovah Witness church services but it became a source of tension in her marriage. Whenever she came home from church, she and her husband would get into an argument. Finally, she stopped going to the church meetings completely and eventually lost all interest in religion. In 1973, she and her husband moved to Scotland due to his new work assignment. While in Scotland, she became very ill. Tests revealed that she had adhesions which required surgery. The surgery went smoothly and she was discharged after spending one week in the hospital. However, it wasn’t long before she became ill once again. A strange feeling of numbness came over her and she feared that she might be having a stroke. She was hospitalized once again and had to have another operation in which three feet of her intestines were remove. In two weeks’ time, the woman had two surgeries. After the second surgery, the doctors discovered that a leakage in her intestines had occurred. Because she was too weak to have a third operation, the doctor hoped that the problem would be corrected without any intervention. Unfortunately, things went from bad to worse. One night, while in the hospital, the woman felt the sensation of heat on her stomach. It turned out to be blood. She discovered that her wound had reopened. She tried to push the call button to summon the nurse but she was not able to do so. Fortunately, a patient noticed the crisis and rushed to get help. Even though she was extremely weak, she had to have another surgery. The doctor felt certain that the problem was finally corrected. However, even after the third surgery, the leakage in her intestines continued and the doctor was at a loss to understand why. The woman was in intense pain day and night. Even the strong pain killers that were given to her did not ease the pain. The doctor spoke to her husband and explained the grave nature of her condition. She needed to have a fourth surgery but if she did, there was only a 40 percent chance that she would survive it. If she did not have the surgery, she would die. The woman was so ill that she no longer cared if she lived or died. She didn’t want to suffer any more. All she wanted to do was to die in peace. One day as she was lying in bed thinking about her hopeless situation, she began to cry. At that moment, she saw a man with a brown robe enter her hospital room. He spoke to her kindly and said, “Poor child, you have suffered too much. Can we pray?” She told the stranger that she no longer prayed. She was convinced that God would not listen to her prayers because she felt that she was unworthy. The man held her hand and prayed. After the man left her room, the woman prayed with all the sincerity of her heart, “Please God, I don’t want to suffer anymore. Let me die tonight peacefully. Either that, or give me back my life. I promise I will be a good Christian.” When she finished the prayer, she asked the nurse to call her husband. She wanted him to buy her a cross. The next morning when the nurse came into the room, she was surprised to see the change in the woman’s condition. The woman looked strong and healthy. The nurse checked her blood pressure and her temperature and they were both normal. She checked the incision from her previous surgery and it looked as though the healing process had finally begun. “I wonder why you are scheduled for surgery today,” the nurse said. “Everything looks so normal.” The nurse then called the doctor to come and examine her. Tests revealed that the leakage in her intestines had stopped. The doctor said he had heard countless miracle stories through the years, but this was the first one he had ever seen with his own eyes. “You must be a very special person,” the doctor said. Not long after that, the woman and her husband returned to the United States. Because she was still very weak, she stayed at her mother’s home and her mother took care of her. She called one of the parishes in her area and said that she wanted to receive instructions in the Catholic faith. Several nuns from the parish visited her regularly, teaching her the catechism and after studying for six months, she was baptized. Four years later, the woman returned to Scotland. She wanted to look for the priest who had saved her life and to thank him for what he had done. She visited many of the local parishes looking for him but to no avail. While in Scotland, she met a nun who was visiting from Ireland. The nun had heard the story of the woman’s healing and asked for a description of the priest who had prayed for her. The woman told her that he had large eyes and a beard and wore a brown robe. Farley Clinton was in Rome in 1964 when he made the acquaintance of an Italian nobleman, a Marchese, who spoke to him about Padre Pio. At the time, Farley had a very limited knowledge of Padre Pio. He had heard about some of the miracles and other extraordinary phenomena associated with Padre Pio but it left his heart cold and unmoved. He did not feel that such things were of importance in the spiritual life. The Marchese agreed with him completely. For as long as Farley could remember, he had a desire to see and speak with a saint. But he wanted to meet a saint who was steeped in holiness rather than one who worked miracles. His idea of a true saint was St. John Vianney, the Curé of Ars. “Padre Pio in many ways is like St. John Vianney,” the Marchese explained. “He lives in deep union with God and prays many hours each day. He too is steeped in holiness. Why don’t you accompany me to San Giovanni Rotondo? I think you would find it an interesting experience,” the Marchese said. Farley accepted the invitation and looked forward to the trip. The next day Farley and the Marchese attended Padre Pio’s Mass and Farley was able to observe Padre Pio closely. He later spoke of the experience and said, “Padre Pio’s eyes were full of suffering, of keen sensibility to everything. He was very beautiful. That might be a strange thing to say about a man who was seventy-eight years old, but it was true. His face had a radiance, a luminous quality.” That afternoon, Farley experienced what thousands of others had experienced before him – the intense fragrance of perfume that surrounded Padre Pio. Farley had been tormented for more than a year by a number of perplexing problems. He had consulted theologians, priests, and even experts in psychology, but none of them had been able to help him. During his visit to Padre Pio’s monastery, those problems simply vanished, never to return. After he and the Marchese returned to Rome, Farley had time to think about all he had experienced in San Giovanni Rotondo. He realized that his preconceived ideas about Padre Pio had been totally wrong. The trip had been more meaningful that he had ever imagined. Farley said, “It was possible to communicate with Padre Pio very intimately without words. He gave clear signs of knowing one’s secret thoughts, sins, and prayers. If he prayed for you and assured you that all would be well, however impossible your situation might seem, you could trust that everything would work out for the best.” Farley felt convinced beyond any shadow of a doubt that he had truly met a saint. On February 16, 1960 Dr. Frank Ceravolo was admitted to the Jersey City Medical Center. After many tests were run, a nephrologist (specialist in kidney diseases) spoke to Dr. Ceravolo and told him that the tests revealed that he had a progressive kidney disease called Glomerulonephritis. The doctor was forthright about the very serious nature of his illness. Tears filled Dr. Ceravolo’s eyes as he listened to the doctor explain the diagnosis, and he prayed silently asking God to give him strength. Dr. Ceravolo was only twenty-eight years old with a wife and small daughter. The United States was a relatively new environment for him, having arrived not so many years before from his native Italy. He had been working long hours at the hospital and had been experiencing continual exhaustion but he did not think that was so unusual. He had made extreme sacrifices in order to be in the place where he was. His future looked bright and his whole life was in front of him, or so he thought. With everything going so well, how ironic it was for him to suddenly learn that he had contracted a life-threatening disease. Our Lady of Grace monastery church in San Giovanni Rotondo. Padre Pio was transferred to this monastery in 1916 and remained there until his death in 1968. 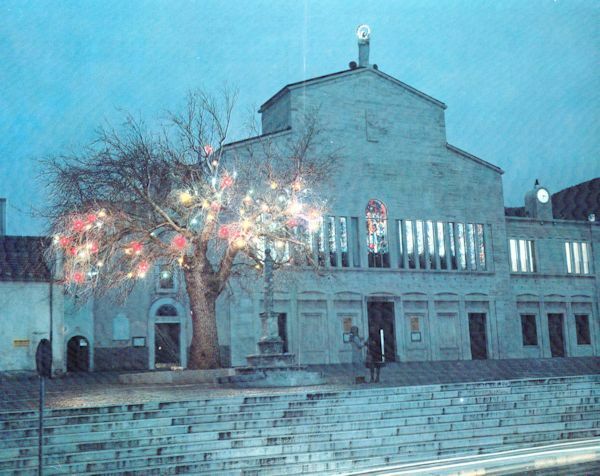 After months of illness, Dr. Ceravolo decided to make a trip to San Giovanni Rotondo. He wanted to speak to Padre Pio personally and to ask him for his prayers. Because he was so sick, the trip to Italy proved to be sheer agony for him. On the third day of his visit, he finally had a face-to-face encounter with Padre Pio. 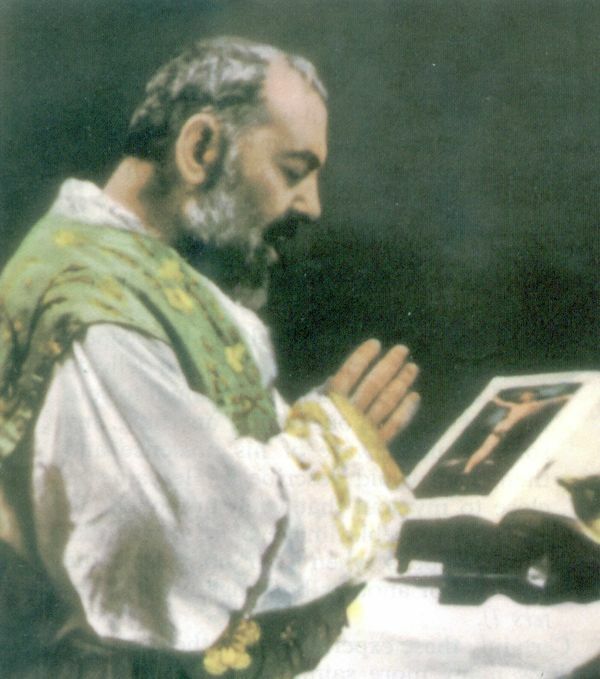 Padre Pio paused momentarily in front of Dr. Ceravolo in the church and pressed his hand to the doctor’s lips. The doctor was instantly enveloped by a beautiful fragrance of roses, lilies, and “flowers not from this earth,” as he described it. Afterward, Padre Pio continued walking down the hall. Oddly enough, the farther away he walked, the stronger the perfume became. The next day, Dr. Ceravolo was standing in the confessional line, waiting for his turn to make his confession. There was no doubt about it, he felt scared to lay his soul bare before Padre Pio. The man who had been in front of him in the line was almost running as he came out of the confessional. By the look on his face, it was obvious that things had not gone well. Dr. Ceravolo became even more nervous and he began to tremble. “Look what just happened to that poor fellow. Perhaps I should not go through with this,” he said to himself. Padre Pio then spoke to him and said, “Come, my son.” He hesitated but Padre Pio was calling him and he felt that he had to respond. Padre Pio had a beautiful smile on his face as he greeted Dr. Ceravolo. His friendliness calmed the doctor who was then able to regain his composure. When the doctor finished his confession, he noticed that Padre Pio was staring at him intently. He seemed to be looking just above his head, his eyes fixed on some unspecified point. He had a very sad expression on his face. “Poor son,” Padre Pio said to him. “He is probably seeing all the misfortunes of my life and he feels sorry for me,” Dr. Ceravolo said to himself. The following testimony was written by a man in England (name withheld) who learned a valuable lesson regarding the sanctity of life. When he discovered that his wife was expecting their fifth child, he reacted in a spiteful way. But he eventually came to realize that each child is a gift from God and a true blessing. It seems clear that Padre Pio helped to open his eyes and his understanding. I am married to a wonderful and devout Catholic woman. We have four children and my wife has always made sure that our children have received a good religious education. I stopped going to Mass more than ten years ago. I was shocked when my wife told me she was expecting our fifth child. I did not want the baby and I was angry. When my wife gave birth to a baby boy, Stephen, I shrugged it off. As far as I was concerned, it was just another mouth to feed. But it was soon apparent that something was seriously wrong. Tests revealed that our son’s kidneys were completely useless. One was not even a kidney at all but “mush” as the doctor called it. My heart went out to our little boy. All day long, his body jerked in pain. The doctors operated and took the “mush” away and then discovered that his other kidney was badly damaged and the tissues were dead. They told us there was no hope. Stephen’s eyes were sunken and he looked like a skeleton. The ward sister and the doctors told us it was just a matter of time. They advised us to take him home from the hospital so that he could die at home surrounded by his family. I broke down when the doctor was talking to us and I suddenly had a desire to go to church and make my confession. In the confessional, I was very repentant. Around that time, I saw a book in a Catholic book shop on Padre Pio and purchased it. I read it from cover to cover. When Stephen came home from the hospital, he ate nothing, drank nothing and grew weaker by the day. His eyes stared listlessly. After two weeks at home, we saw that the end was imminent. We couldn’t watch our baby die. We hurried to the hospital with him. The hospital staff said that he would probably not live through the night. I prayed and prayed to Padre Pio and to our Blessed Mother. I swore that I would never leave my faith again if my son’s life was spared. I cut out a picture of Padre Pio from the book I had read and slipped it under Stephen’s pillow in the hospital. He did not die that night. Each day he lingered and I continued to pray, day after day. One night I woke up. It was dark outside. Our bedroom was saturated with the perfume of roses. The aroma was over powering. The next day the doctor informed us that there was an improvement in Stephen’s blood. His kidneys were working. Days turned into weeks. The doctors were amazed. They are still amazed. Stephen is now six years old. Stephen has brought so much happiness into our lives. He is my pride and joy. I have not faltered in my faith and I attend Mass each Sunday. I still say my novena to Padre Pio every day. So really there were two miracles, a miracle for Stephen and a miracle for me. My heart was once hard but it is no longer hard. It’s true Lord that you are always thinking of us. From the beginning of time, before we existed, even before the world existed, you have been dreaming of me, thinking of me, loving me. And it is true that your love created me. It’s true Lord, that you have conceived for my life a unique destiny. It’s true that you have an eternal plan for me, a wonderful plan that you have always cherished in your heart, as a father thinks over the smallest detail of the life of his little one, still unborn. It’s true that, always bending over me, you guide me to bring your plan about, light on my path and strength for my soul. . .You the divine Attentive One, you, the divine Patient One, you the divine Present One, see that at no time I forget your presence. I don’t ask you to bless what I myself have decided to do, but give me the grace to discover and to live what you have dreamed for me.